'Bombay.' 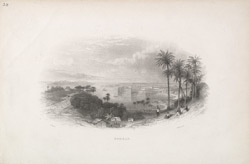 General view of Bombay. Arthur Willmore after Thomas Allom. bl.uk > Online Gallery Home	> Online exhibitions	> Asia, Pacific and Africa Collections	> 'Bombay.' General view of Bombay. Arthur Willmore after Thomas Allom. Engraving of a general view of Bombay by Arthur Willmore (1814-88) after Thomas Allom (1804-1872) and dated c.1840. The area of Bombay was originally composed of seven islands. In 1661, these islands were acquired by the British Crown from the Portuguese as part of the marriage dowry of Catherine of Braganza when she married Charles II. From 1668, the East India Company leased the land from the British Crown and developed the area as a trading port. A manor house of the Portuguese, situated on Bombay Island, provided a suitable site for the fort. A custom house, warehouse, quay and fortifications were also built soon after. In the 18th century, the town surrounding the fort was developed. This included the contruction a number of public buildings, the creation of outer fortifications and the clearance of land surrounding this area. In this view, the flagstaff within this area is shown. By the 1860s, the need for military defence lessened and Governor Sir Bartle Frere demolished the fort walls. As a result, Bombay underwent an ambitious phase of building in the Victorian style.